We got some big news this week, and it was that the entire Sound of Music cast is reuniting, for the first time since 1965, on Oprah. Read it again, it's still true. And this is so, so wonderful. The Sound Of Music Cast Coming To Oprah! 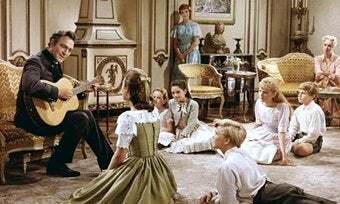 Mark your calendars for October 29, when Captain Von Trapp, Fraulein Maria, and all 7 children (now, obviously, 45 years older) will gather on Oprah's set to talk about the filming of the iconic musical. While the children and Fraulein have reunited before, the paterfamilias was conspicuous in his absence. This time around, even Christopher Plummer, who in the past has likened the film to being bashed with a Valentine and churlishly refused to cooperate with the DVD special features, will apparently remember strictly his favorite things for the special — that's the power of Oprah. In a recent interview, he even gave this tepid endorsement: "It is not a film which I detest...The press have always got that wrong. I didn't hate the movie at all. I just didn't think my role was terribly exciting." NOT EXCITING?! You're only a patriarch with a jaw-dropping dramatic arc who defies the Nazis, wins the Salzburg Festival, beats out GOD for the girl, and sings "Edelweiss!" Seriously, for those of us who grew up on the film, the idea of anyone involved disavowing it seems tantamount to sacrifice. What exactly is it that's so appealing? Is it the scenic views, that mansion, the orphan factor, the love story, the puppets, or just the music? To a child, the newly-liberated Von Trapps seem to have it all, from companionship to an at-home puppet theatre to an ability to perform for all your parents' friends without anyone getting irritated. And by the time you realize the weird factor — that "You Are 16" is performed by a Nazi youth, and that the actual Fraulein Maria was apparently something of a tyrant who didn't want the kids marrying or leaving home — it's a part of your life. So, for those of us who can't help but do a little spin every time we get to a hilltop, this reunion is big news. And yes, the Von Trapp Family Singers will perform! Or, at least, a group composed partially of actual descendants — the Von Trapp Children. Also, some students currently mounting a production of the show. No word on Rolf's whereabouts. But either way, they had us at "Edelweiss." And had better be in matching playclothes, or we will be seriously displeased.